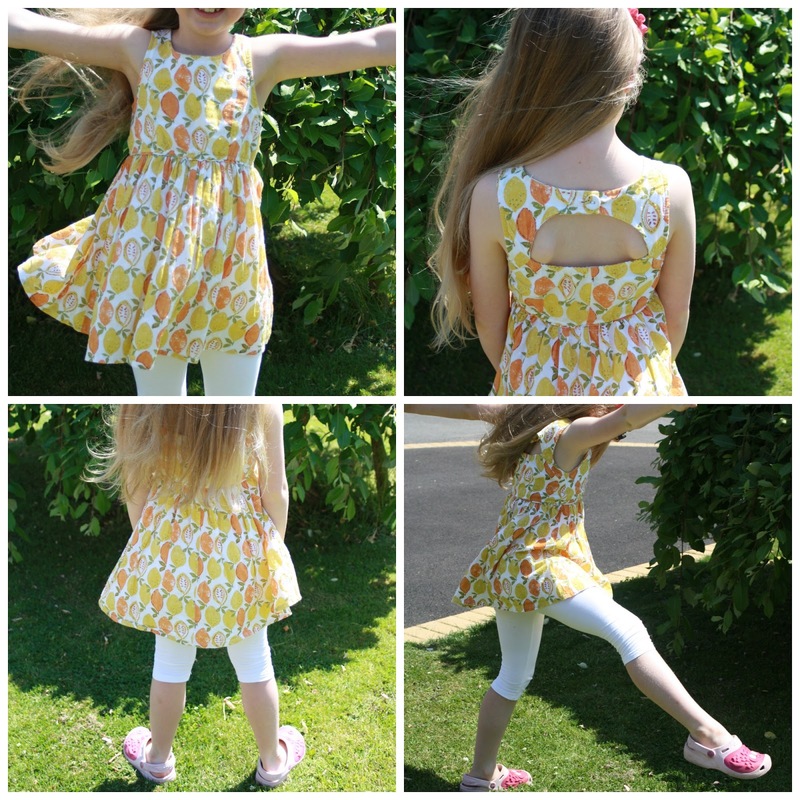 I bought this lemon design Next tunic and leggings set in the summer sales two years ago, for my daughter to wear last year. As is always the way with very pretty, summery outfits, she didn’t get a lot of wear out of it! She looked lovely when she did wear it and really enjoyed wearing it. But most of the time the weather was just too cold for a strapless, backless tunic top. Although she did wear it over a white long-sleeved Next Tshirt a few times, or with a cardigan, to get a little bit more wear out of it in the great British weather. And once we’d reached the end of last summer, I thought we’d seen the end of it. Because my daughter grows! Outfits only last a year (or a season) and they’re always too small the following year. So you can imagine how pleased I was when my tall 7 year old daughter got this age 6 outfit of the wardrobe and it still fitted! Yes, the leggings are most definitely cropped now, but the top still fits perfectly. I look forward to a few more sunny days and hopefully getting a little bit more wear out of this outfit. She’s teamed it up with her trusty Crocs here. Yes, they are unattractive things, but they are certainly practical! My daughter likes to look beautiful, but she also likes to be able to Do Stuff. And you can Do Stuff in Crocs. Plus they’re really quick to put on when you’re just in too much of a hurry to struggle with shoe laces! It’s a very pretty outfit. Thanks very much, everyone 🙂 Tops and leggings are a good compromise I find, Nikki. This time last year I managed to convince my daughter this actually was a dress. Result! Just a dress that you wear with leggings! such sweet pictures of your daughter! so nice to finally get a decent wear out of all those summers clothes that usually collect dust, long live this beautiful weather! Thanks 🙂 It’s so nice when they finally get to wear these things. It’s not so bad for us having things that can only be worn once a year, but not great for the kids when they keep growing!